Bill McQueen is proud to announce that Jay Fleece joined Legacy Protection Lawyers as a partner on January 1. Joseph W. “Jay” Fleece, III, is a native Floridian having been born and raised in St. Petersburg. 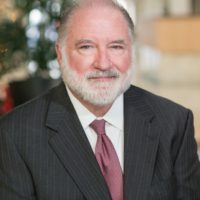 Mr. Fleece started practicing law in 1980 with the firm of Belcher & Fleece, P.A., and subsequently joined Holland & Knight, where he was a partner heading up the litigation department of the St. Petersburg office. In 2004, Mr. Fleece formed the estate and trust litigation firm of BaskinFleece located in Clearwater, Florida. Mr. Fleece is a graduate of Tulane University and Stetson University College of Law. Mr. Fleece is an AV rated lawyer by Martindale Hubbell and has been named as a Florida Super Lawyer since 2007 and as one of the Best Lawyers in America since 2010. Mr. Fleece’s practice has focused on estate, trust, and fiduciary litigation for the past 37 years and he has been involved in many complex cases throughout Florida, both at the trial and appellate levels and has appeared as counsel in matters in California and South Carolina. Mr. Fleece is a Fellow of the Litigation Council of America and is admitted to practice in Florida as well as the United States District Court, Middle District of Florida; U.S. Court of Appeals for the Eleventh Circuit; U.S. Tax Court; and the United States Supreme Court. Mr. Fleece has also been active in his community, having previously served as president of the Police Athletic League, PARC, Sunshine City Jaycees, and he has previously served on the boards of the local YMCA and Red Cross. Mr. Fleece is a past Commodore of the St. Petersburg Yacht Club and a former Chancellor of the Episcopal Diocese for South West Florida. Currently, Mr. Fleece serves as a member of the Board of Trustees of Johns Hopkins All Children’s Hospital, having previously served as Chairman of the Board and is also serving as the current Vice Chair of the Pinellas Community Foundation.